Some Exchange servers have expired or self-signed certificates for testing purposes. Use this setting to ignore certificate errors. The default folder to upload to. This must be a well-known default folder such as "inbox", "sentitems" etc. Specify the hostname of your Active Directory machine here. In some cases simply the machine/computer name will do in others you need to specify	ComputerName.yourdomain.com. You can use localhost or leave it blank if Active Directory is running on the local machine. NOTE that all email in the journal account will be deleted after being successfully added to the archive. 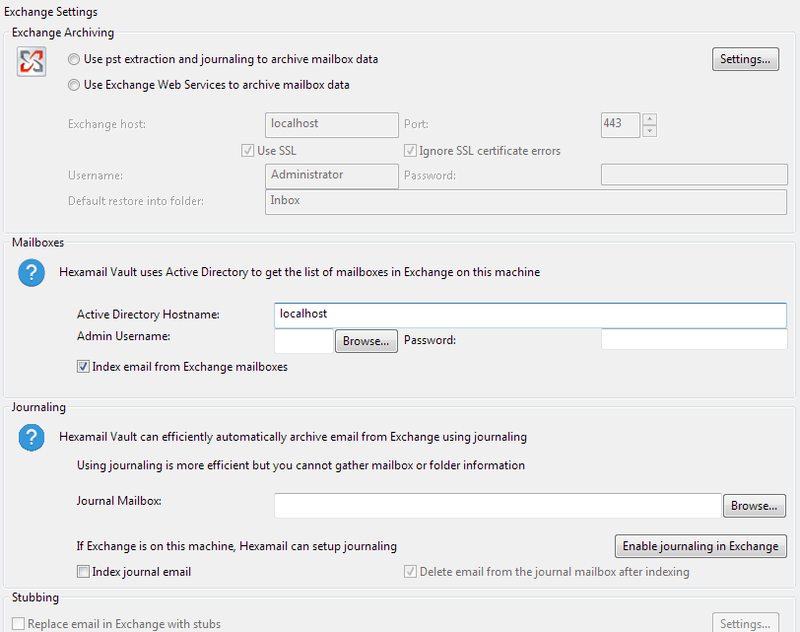 Press the button to automatically enable journaling in Exchange to the selected mailbox. If journalling is already setup Hexamail Guard will use the current journal account for archiving. You can choose to expire email from user mailboxes in Exchange when it reaches a certain age.